Featuring with modern style and wall mounting design, bathroom hardware accessory set adds concise and classic style to your beautiful bathroom. Distinguished by contemporary look, this bar holder offers an attractive way to keep your towels conveniently located. Made of high-grade stainless steel, this towel bar set is solid and rustproof, ensuring durability and longevity. Come with all screw mounting accessories, including concealed screws and screw anchors. Sold in set of 4pcs to hang robe, coat, clothe and towels on wall, space-saving and money-saving. Bar set offers additional space in bathroom. Ideal choice for small space, keeping countertop free of clutter. LuckIn 4-piece bathroom towel bar set. Premium 304 stainless steel construction for durability. 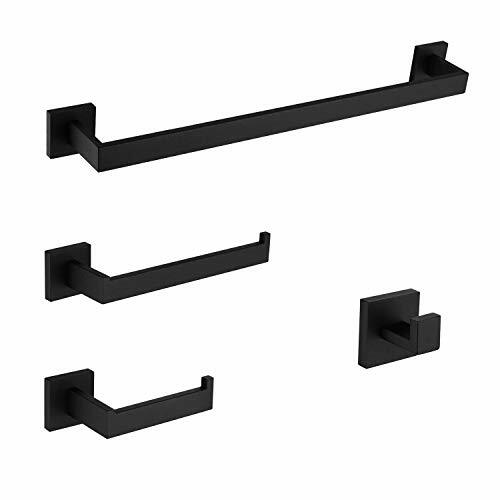 Matte black keeps bar holder resist corrosion and tarnish. Bar set provides additional storage in bathroom space. Concealed screws offers modern&concise style to wall.